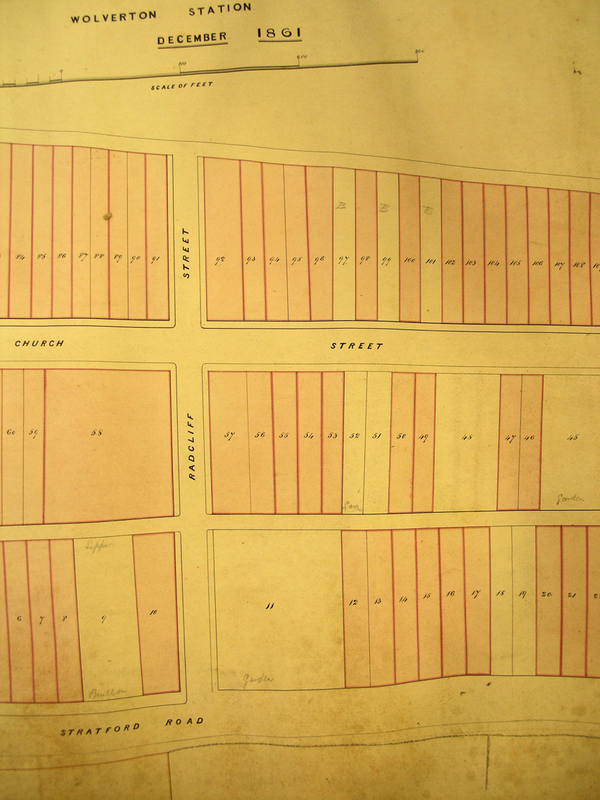 The Square was a product of the 1890 and I think was intended for residences, very much like Glyn Square was in 1840. It remains much as it was, except for the loss of connection with Radcliffe Street. Shopping development, as we have seen, began in Bury Street and expanded to Creed Street. When new building lots were put up for sale in 1860, some shops of necessity moved from Bury Street to the Stratford Road and one or two began to appear in Church Street. “The Front” filled up with commercial establishments first and then, logically, Church Street. 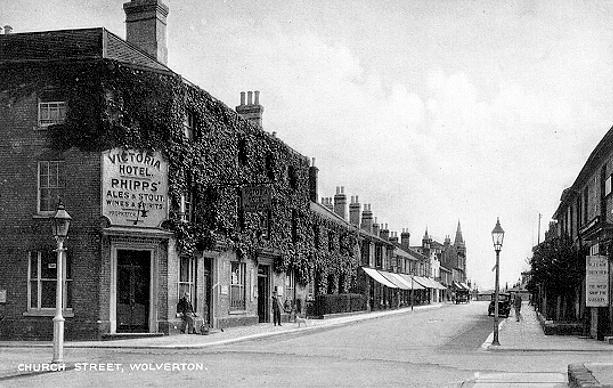 As Wolverton expanded south and west, the Square came into its own as a fourth phase of shopping development. Growth was gradual and even by 1939, one third of the houses were still private dwellings. This view of Moreland Terrace taken circa 1911 shows the early mixture of shops and residences. Moreland Terrace: Odd numbers from North to South. The Square, West Side: Sequential numbers South to North. This view of Church Street from the 1920s gives us a flavour of what Church Street looked like for most of the 2Oth century. The Vic is dominant, but all the houses on the north side up to the Empire had been converted to shops – and so they remain. The south side (now demolished) was more of a mixture of commercial and residential. 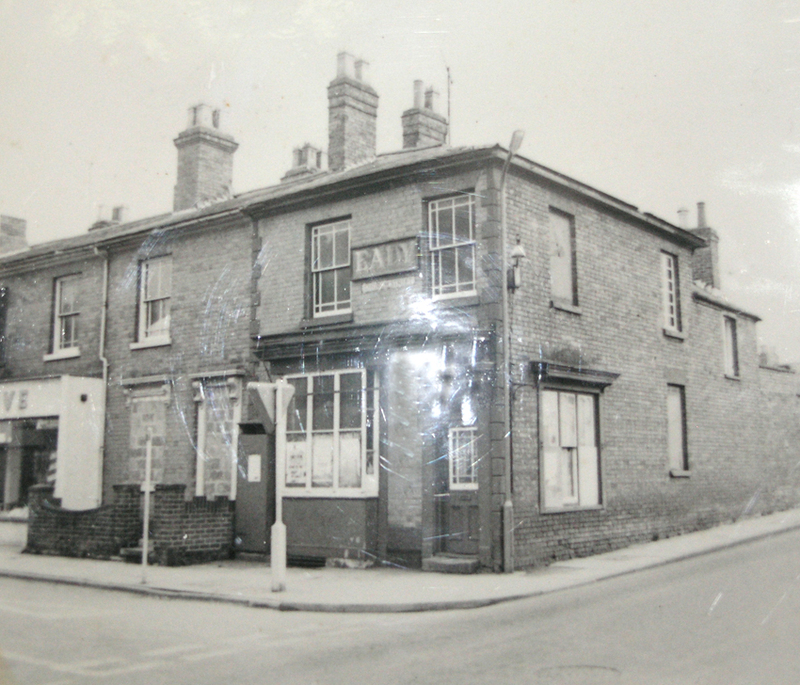 The first shop conversion, as far as I can tell, was the house at Number 8, shown below. This was the house at the left which in 1861 shows up as a Chemist and Druggist, then owned by George Ward Davids, a widower in his thirties with two small children. 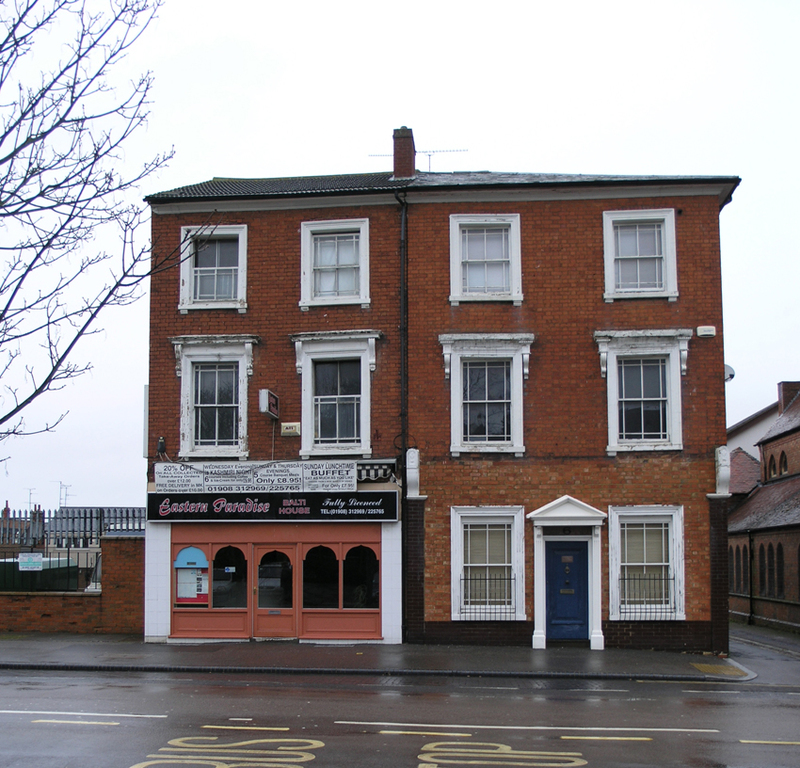 He moved away from Wolverton soon afterwards, but a chemist practised from here for about 100 years. The shop frontage had more conventional, early 20th century plate glass windows and was not as now represented. The house to the right, now numbered 6, was empty in 1861, but later became a bakery. By 1871 a few more commercial enterprises had opened on Church Street. It is not alway possible to pinpoint the location, because of variances in the numbering in the 19th century, but in some cases I can make a reasonable inference from 20th century usage. William Covington established his bakery at the corner of Radcliffe Street and Church Street. Again this functioned for over 100 years before it was pulled down to make way for the Agora development. 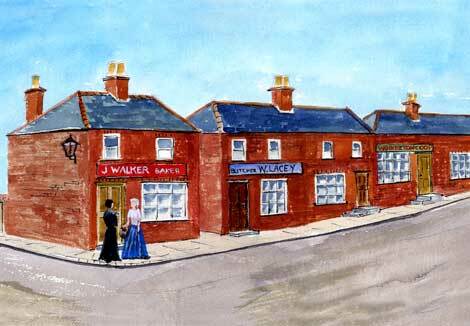 James Irons has set up as a coal merchant, probably on the south side where Tilleys ran the successor business. Lewis Camozzi has a builder’s yard. Again I suspect on the south side. There is a confectioner, Thomas Sear, and a Grocer, James Harrison. It is likely that they were on the north side, probably between 30 and 34. And there are two tailors, John Mitchell and James Sykes. I think the Sykes went into a third generation of Tailors on Church Street. By 1881 John Eady had opened his butchers shop opposite Covington’s Bakery. this business went down through at least three (or possibly four) generations before it was closed by the Agora development. A number of these houses were still private until the 20th Century, as you can see from the following table. On the north side, houses 14-20 were cleared to make way for the new General Post Office, and 22-24 for the Empire Cinema. These changes took place in the late 1920s and mid 1930s. More recently Numbers 10 and 12 have been demolished for Post Office expansion. It is interesting to see the continuity of function in some shops, Number 28 for example, which still operates as a jeweller today. pton Building Society, then the Anglia Building Society and now Nationwide. These buildings were torn down and redeveloped. The houses from 58-64 were converted to a furniture warehouse. Lawsons the newsagent and stationery dealers moved into No: 58 and the other three units were rebuilt as a Co-op Furniture Store. It is now Maisies. The south side of Church Street never developed quite as fully as the north side in shop conversions, possibly because the rising ground meant that customers had to climb steps. The key shops were the butcher, Eady, pictured above, and the bakery on the opposite corner. The Co-op may have had a grocery at Numbers 15-17. After the war they opened a Men’s Outfitters at Number 29. Another curiosity was Fred Anstee’s shop at Number 33. He sold radios (or “wirelesses” as they were originally called), sheet music and records. Most of these buildings were demolished to make room for The Agora. Throughout the 1850s Wolverton wanted to expand, needed to expand, but the Radcliffe Trustees were unwilling to sell any more farm land. Accordingly, the L&NWR purchased land down the hill from the neighbouring manor of Stantonbury, owned by Earl Spencer in the 1950s. New Bradwell was born. 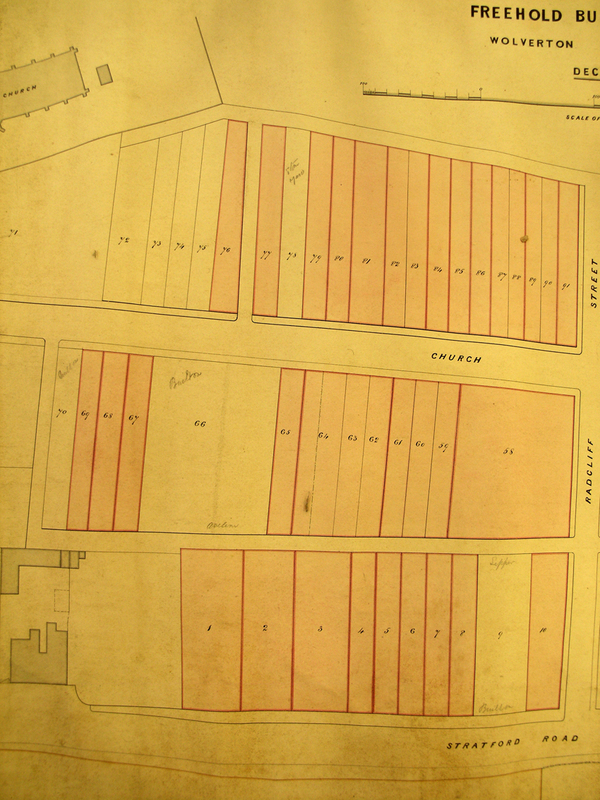 In 1860 the Trustees finally relented and release land to the west of Bury Street. The northern portion was used for workshops and south of the Stratford Road was used for residential and commercial development. 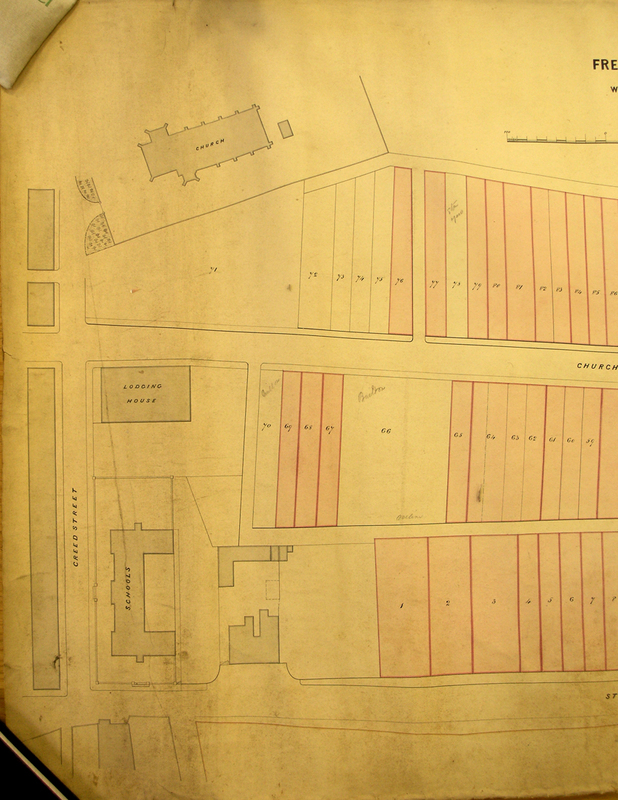 Unlike the earlier development which was undertaken entirely by the railway company, the new building lots were to be sold for private development. 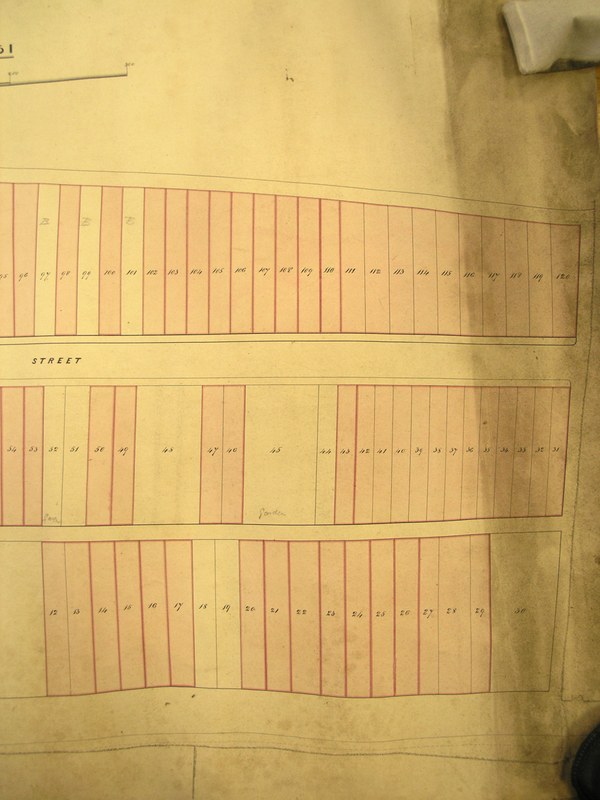 There is a plan from 1861 in the Buckinghamshire Archives which I reproduce here in four sections. They can be read from left to right, or east to west. The first part here shows the pre-existing buildings in grey shading – Creed Street, St George’s, the recently-built Lodging House on the site that was later the Church Institute, the School Buildings, the Royal Engineer and the end of Bury Street. The plot numbers do not quite correspond to what was built later or to subsequent numbering. Plot number 1 on the Stratford Road is now numbered 6, 7 and 8, and if you look at the roof profile you can infer that they were built at the same time. The building which became 9a and b looks as if it filled Lot 2 and the North Western, built around this time, must have taken Lot 3. The two smaller houses/shops filling in the access to the Western yard must have been built later. The three storey building which later accommodated the Grafton Cycle Company looks as if it filled Lots 4 and 5. Then there are three buildings filling Lots 6,7 and 8, two filling Lot 9 and the corner building for Lot 10. This first house was built by the enterprising Charles Aveline, whom we have met before on Bury Street. By this time the Bury Street shops had been demolished, so he had a good reason to be the first to sign up for a new lot. I suspect that the first house (No. 6) was erected and occupied and the other two units added later. Aveline also became the post master and ran the Post Office from here as well as his building operations. The house numbered 9a and b was occupied in 1861 by a grocer, Abraham Culverhouse. 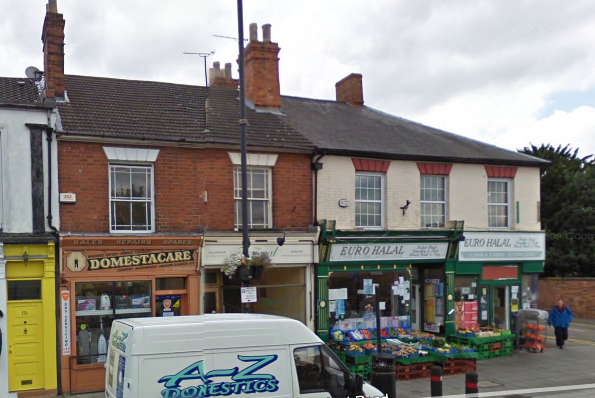 These two were the first Stratford Road shops. A year later, John Lepper, who had a Grocery on the corner of Gas Street, built a new shop and house on Lot 9. You can see the name Lepper pencilled in on the drawing. 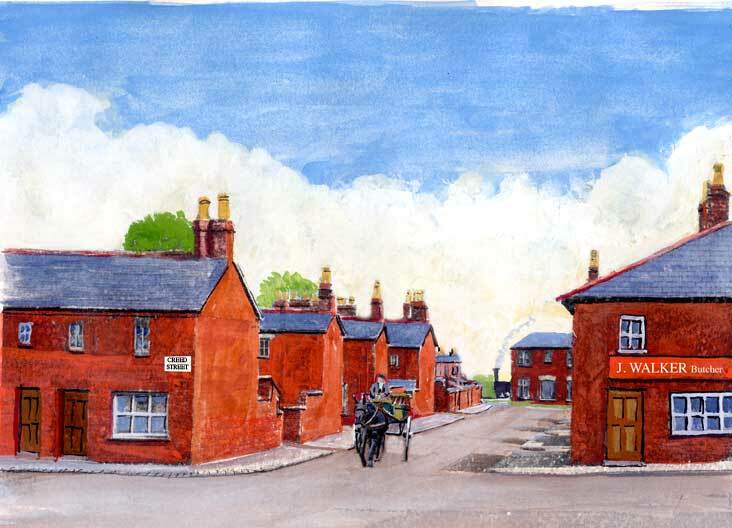 I think the house and shop that Lepper built was the red brick one showed here, now numbered 18 and 19. Later this became divided into two shops but the one on the right, Number 19, remained a grocery until well into the 20th century. The early development of “The Front” was patchy, in the way of all new development. But it is possible to identify the way it looked in, say, 1862. 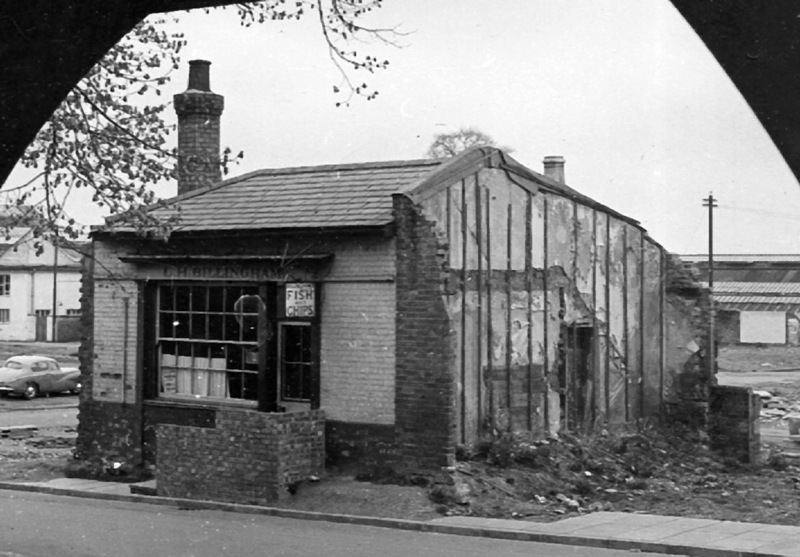 There was The Royal Engineer, which had been there since 1841, then Aveline’s fisrt three buildings, the Culverhouse’s grocery at Number 9 and Lepper’s at Number 18-19. The North Western appeared in 1864. The early history of Wolverton’s development, as I have often remarked, was characterised by an absence of forward thinking. This was understandable. Nobody in 1838 had any idea of the future importance of railways and certainly not of Wolverton, which at the time was thought of as a service and maintenance depot. 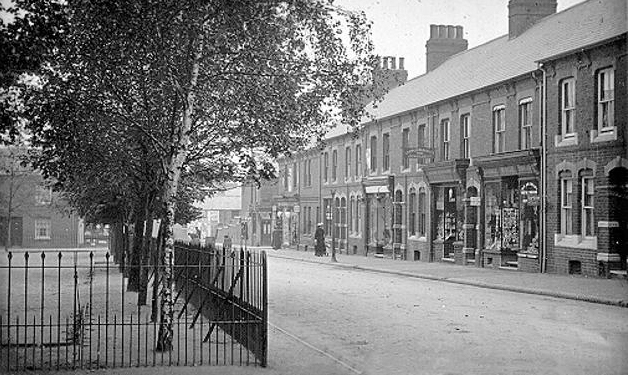 The first shops were sited at the very north end of the new town, but with the development of the southern streets, closer services were required for those residents. Accordingly, in the late 1840s, a short row of shops were erected on Creed Street on the rising ground opposite the Church. I have written in some detail about these shops here. These buildings survived until demolition in the 1960s, but as shops they closed shortly after 1900, with the exception of the former Co-op grocery which became a Fish and Chip shop, run by Maskell in the 1940s and Billingham in the 1950s. This photograph, taken while they were demolishing the “little streets” gives us some idea of the split-level construction of this building.